It’s very common for any Webmaster or Blogger to notice some traffic to their website / blog arriving through GoogleWeblight. Don’t panic if you are from same category, its normal activity happening with all the webmasters or bloggers around the world. Today, we are here to discuss every little thing about this newest inclusion by the search engine giant, GOOGLE. In simple words, GoogleWeblight is the first step taken by Google, to enhance the surfing experience of countless individuals with the slow or average internet connectivity. At first, it has been launched in Indonesia, later in India and Brazil as Smart Phone users in these countries are growing up with very rapid rate. Majority of the people in these countries are still using the 2G networks, which is very slow in compare to the 3G or 4G networks. Technical people will call this GoogleWeblight feature as Streamlined lite edition of mobile search. At present, this feature is only available for the Android devices with Google Chrome browser. 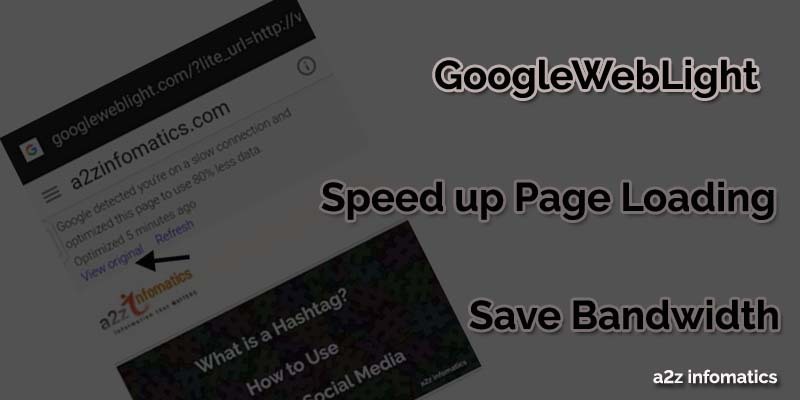 To better understand this GoogleWeblight, suppose any Android user is searching something in Google Search using the Google Chrome browser, while searching if the browser (Google Chrome) notice the average or slow connection speed, it will automatically load the Lite edition of mobile search. It will switch the main page to the light edition, which in return will help to load the webpages much more faster. What does GoogleWeblight meant for the end users? The end users will enjoy the loading of the webpage 4X faster than the normal. In addition to this, it will help to save the expensive internet data by 75-80% by consuming less bandwidth. The lightening speed of this GoogleWeblight feature will help countless users all around the world to surf more and more, without worrying for their slow internet connection. They never have to wait for minutes for any single webpage to load. Below is the comparison between the load time using normal Google search and the GoogleWeblight. For the comparison, 2G internet connection with near about 40 KB speed is used. Don’t worry, if anybody didn’t like the lite version of the webpage. You always have the option to opt out LITE version by simply clicking to the “View Original” link at the top of the loaded page. 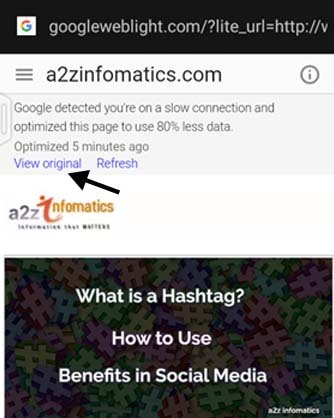 Below is the preview of a2zinfomatics LITE version, we have highlighted the option to view the LITE webpage in the normal mode. 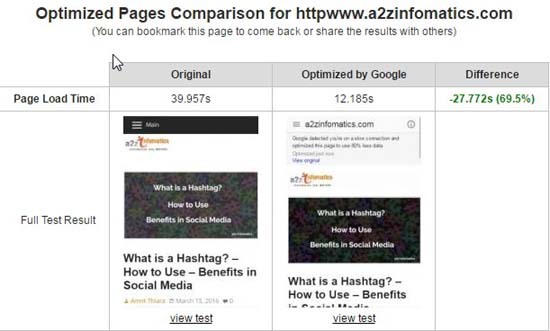 Important: We had tested and compared www.a2zinfomatics.com loading time at Webpagetest using GoogleWebLight and the Normal Mode, you will be shocked to know that the difference is near about 70%, The LITE version is loading our website rocketing fast and used 80% less data. What does GoogleWeblight meant for the Webmasters OR the bloggers? If you are a Webmaster OR Blogger, you have to be aware of this fact, if any Android user with a slow connection, visit your website using Google Chrome, the LITE version of the webpage will be served to that user. 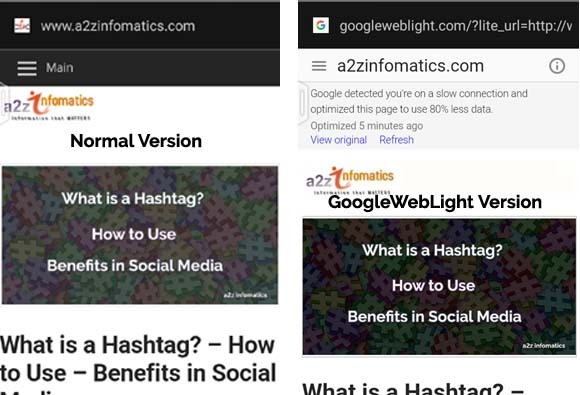 GoogleWeblight will remove all the heavy elements from the webpage, will only offer simple text to the user. Don’t worry if you are associated with any Ad Network, by default the advertisements from Adsense, Zedo and Sovrn will work in the LITE version, if you are on any other Ad Network, you can use this link to whitelist the same to work with the LITE version. There is another option to opt out GoogleWeblight by styling the HTTP header (Cache-Control:no-transform) in the page response. By using this custom setting, Google will never send any user to the LITE version of the webpage, but we recommend not to use this option, for the sake of the remote area user, surfing the net using slow internet connections. Leaving this to the default will make your content visible to all the users, especially the users with slow internet connections. Don’t you think this is the first wish of any caring blogger. Important things to remember about GoogleWeblight. You will not get the stats in Google analytics for the pages viewed in the LITE mode. Actually, disabling the heavy elements as of Google Analytic, is making the webpage to load quickly. Although, to check the stats you can use server stats, or you can use wordpress.com stats but it will show googleweblight as the source of the traffic. At present, GoogleWeblight will only work for the Mobile Devices, not for Desktop / Tablet Systems. In case of any problem with GoogleWeblight, you can contact their support at googleweblight@google.com. In the case of opting out GoogleWeblight for the webpages, Google will show them as “Slow Loading Website” in the search results. At present, video related websites or the Sites which requires the cookies, are not served by the GoogleWeblight. We, as a publisher as well as the end user of GoogleWeblight, feeling comfortable with this new LITE version of the webpages. As we are from India, we understand the actual condition of the internet speed in the interior areas, the data speed in these areas still needs a big improvement to match the world standards. Believe us, it’s very irritating to wait for minutes for any single webpage to load. Only due to this reason, UC browser’s popularity has crossed the limits in INDIA. Ok readers, that’s all we have related to this wonderful LITE version of loading webpages. What do you thing about GoogleWeblight, do share your thoughts under the comments section below. Thank you very much for visiting a2z infomatics. We will continue to provide more informative stuff to the internet community. Good Bye, God Bless Everybody.